Jemima Rooper and Marc Antolin as Audrey and Seymour. Photo Johan Persson. Design Tom Scutt. Lighting Design Howard Hudson. Normally I start my reviews with a bit of a preamble, leading to the title of the production. But not today. When a show has got everything right, there is no need to whet the appetite of the reader. 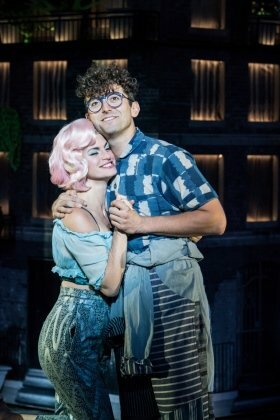 So, let’s talk about Little Shop of Horrors at Regent’s Park Open Air Theatre. The story is pure 1960s ‘B’ movie schlock and is set in a florist’s shop on Skid Row owned by Mr Mushnik (Forbes Masson), a rather run-down part of an urban suburb of New York. The shop is not doing well. In fact, Mushnik is at the end of his tether when his glamourous – at least in her own mind – shop assistant Audrey (Jemima Rooper) suggests that co-worker Seymour (Marc Antolin) bring out the strange and interesting new plant he’s been cultivating and put it in the window to attract interest. The plant (Vicky Vox) which Seymour has named Audrey II, has an immediate effect on things and as Audrey goes off to a date with her boyfriend Orin Scrivello DDS (Matt Willis) you have to wonder if Mushnik and Seymour’s luck has finally changed. I have always loved the movie Little Shop of Horrors. Alan Menken and Howard Ashman based their horror comedy rock musical on a low budget 1960 movie of the same name which is now considered a cult classic, and with an early cinema appearance of a young Jack Nicholson. The story is pretty basic, a boy dreams of success – fame, fortune and the love of his co-worker – and along comes something highly dodgy that helps him achieve it. Almost like a Greek Tragedy, which is why the show has its own Greek Chorus in the shape of Chiffon (Renée Lamb), Ronnette (Christina Modestou) and Crystal (Seyi Omooba). It also has some extremely memorable songs such as the wonderfully emotional “Suddenly Seymour” which always brings a tear to the eye of the more sensitive soul. Looking at this production and wow, have they got everything right? Tom Scutt’s multi-level set is a perfect representation of a run-down New York suburb which combines brilliantly with the costumes to bring life to the production. Seymour looks like a complete nerd, Audrey looks, well it’s hard to say but the phrase “no better than she ought to be” comes to mind. The real star, costume-wise is American drag queen Vicky Vox – making her UK theatre debut – who looks both menacing and stunning at the same time. Performance-wise, I realised during my second favourite number “Downtown” that this was a truly fantastic cast delivering a fabulous performance. The ‘triple threat’ was well in evidence from everyone on the stage and under Musical Director Cat Beveridge, each of the songs came across perfectly. Marc Antolin and Jemima Rooper as Seymour and Audrey were perfectly cast and performed extremely well both together and in their solo numbers especially “Grow for me” and “Somewhere That’s Green” and has a lovely chemistry as the co-workers secretly in love with each other. Matt Willis proves there is life after pop by delivering a barnstorming performance as the sadistic dentist, Orin. There were times when he really seemed to be enjoying his nastiness a bit too much. Also, another mention for Vicky Vox who not only looks amazing but sounds great, her wonderful baritone voice delivering Audrey II’s songs perfectly. If I was to sum up Little Shop of Horrors in one word, then it would be fun. Director Maria Aberg has put together a production where, despite the dark nature of the actual story, everyone is having fun. The cast seemed to be enjoying themselves and their enjoyment spilled over into the audience who definitely had an amazing time. I’m not one for standing ovations but at the end, I was up on my feet clapping, stomping and cheering along with all those around me. Finally, we don’t normally mention the venue, but I have to say, the Regent’s Park Open Air Theatre is just perfect. As the sun set and the lights rose, there seemed to be something so right about a musical concerning a rampant plant being performed in a place surrounded by trees. Maybe we were lucky with the weather but my companion Lynne and I both agreed this was the perfect show in the perfect location and right now I’m telling everyone Little Shop of Horrors really is the must-see production of this summer. One mean green monster musical! Marc Antolin and Jemima Rooper play Seymour and Audrey, with Forbes Masson in the role of East Side florist Mr Mushnik. Matt Willis takes the role of sadistic dentist Orin, and the plant, Audrey II, is played by U.S. drag queen Vicky Vox. Little Shop of Horrors is a spoof musical based on the 1950’s B-movie horror genre. Whilst an affectionate tribute to these movies, the production is likely to be more suitable for secondary school age and over.